The NRC has just posted on its website an updated report about the NRC’s security activities in the 10 years after the September 11th terrorist attacks. The report, titled “Protecting Our Nation,” (NUREG/Br-0314 Rev. 2) outlines important upgrades in security, emergency preparedness, and incident response related to nuclear facilities and radioactive materials. • Force-on-Force security inspections, which incorporate both tabletop drills and simulated combat between a mock commando-type adversary force and nuclear plant security force. • Cyber security as an emerging tool that both domestic and international adversaries can use to exploit potentially vulnerable systems. 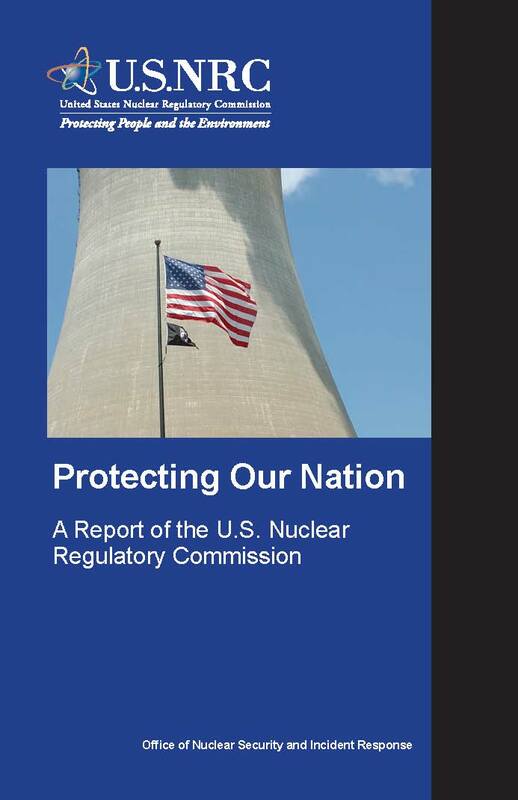 The NRC is working with its federal partners to address this complicated issue. • Incident response exercises as a way to prepare for potential terrorist attacks or other incidents, such as major storms, that could disrupt operations. • Intelligence assessments used to evaluate and warn of possible threats of attacks or other malevolent activities directed at nuclear facilities or radioactive material licensees. The report can be found at: http://148.184.174.31/reading-rm/doc-collections/nuregs/brochures/br0314/index.html. Great website. The issue of cyber security is very important and the nation needs to be very much aware of how to protect themselves from cyber attacks. I’m glad the topic is being discussed. I’m glad they’ve finally updated pre-plan security activities. You would think after sept 11 this would have been priority #1. What a great read, have added it to my favorites list! This is a great post, I’m happy that someone is paying attention to a potentially devastating threat. “The NRC is working with its federal partners to address this complicated issue.” this is a potential big threat, I’m glad to see this issue is being addressed. Can you imagine what would happen if a cyber attack took out the internet! The issue of cyber security is very important and the nation needs to be very much aware of how to protect themselves from cyber attacks. I’m glad the topic is being discussed. Are these updates not well over due? Surely someone could have come up with something sooner, especially when its an entire nation which is in danger. This is a very serious topic and I’m glad that someone is promoting it this strongly. Keep up the good work, Rebecca! This blog is so important. Here I have learn many things that will be helpful for me to contribute for the nation. thanks NRC.